If it was invented in the last year, it probably tracks your health. There’s certainly no shortage of smart connected devices all meant to monitor your vitals and keep you on a healthy lifestyle — everything from watches to pendants to clothes to your bathroom scale. And now, you can add your car to the mix. That’s right — even as you drive (rather than walk, run, or bike) from Point A to Point B, you can still keep track of your fitness levels, and it’s all thanks to the Audi Fit Driver. 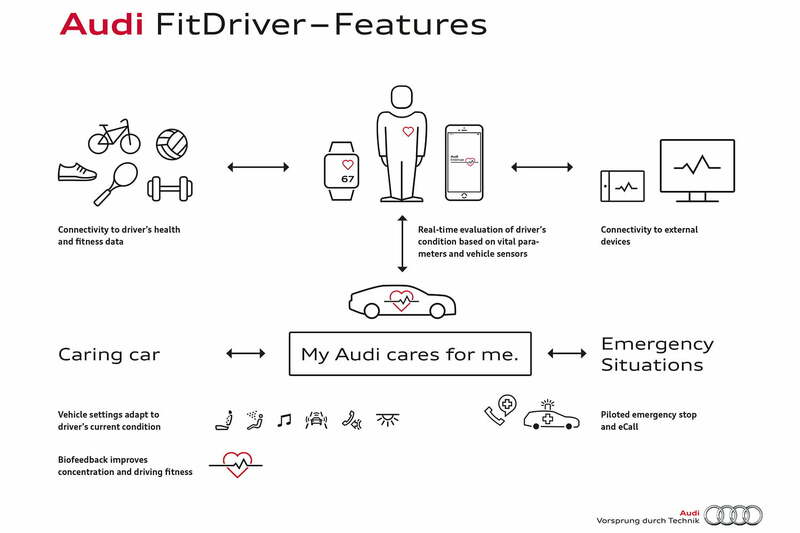 The technology would utilize key points like heart rate and skin temperature provided by a smart watch or other connected device, and then “supplement this data with information on driving style, breathing rate, and relevant environmental data such as weather or traffic conditions.” With this combined knowledge, Audi says, the car would be able to determine the driver’s state of being, including how stressed or fatigued he or she might be, and then act accordingly. “Various vehicle systems act to relax, vitalize, or even protect the driver,” the manufacturer claims. Ultimately, the hope is to “provide the optimal driving experience, custom-tailored to the current condition of the driver by means of, for example, a relaxing or invigorating seat massage, suitable climate control, adaptive infotainment and a fitting interior lighting concept.” So really, it seems that the goal is to keep you in your car for as long as possible (which may be a bit counter-productive when it comes to improving overall health and well-being). Still, Audi notes, the Fit Driver project appears to be the first that seeks “to actively reduce the driver’s stress level and improve concentration.” And as a next step, Audi is looking to “incorporate driver assistance and safety systems, as well as future piloted driving functions,” to make driving even safer. Sadly, this tech is only available to Audis in Germany, but who knows — maybe one day soon, Americans can have the Audi Fit Driver as well.